Brian and his wife Nicole are in the process of sampling all the pizza places in their neighborhood and Joe Pizza was the latest candidate. 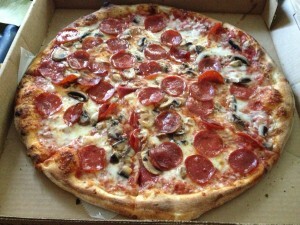 We ordered a large pepperoni and mushroom and a small hamburger, sausage and mushroom. It was on the pricey side - I was surprised the total came to $31. On my friend Christine’s advice, I asked for the pizza to be well done, but they did not oblige. The slices had structural integrity issues, the pie had a floppy center and there was no char on the bottom. I think the crust had good flavor and the toppings were fresh and plentiful. We decided the sausage was the best of the bunch. 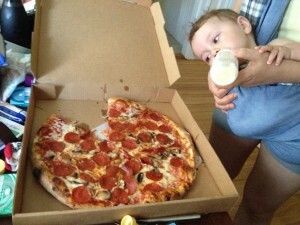 The baby wants pizza, too! Visit my Flickr site to see pics of the food and more!